Universal Garage (Whitby) Ltd is located on Whitby's Business Park, Stainsacre Lane, Whitby. 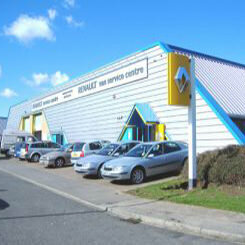 Universal Garage (Whitby) Ltd is the first place to visit if you're interested in the Renault or Dacia Range. We carry a wide range of used vehicles that you are able to test drive. We are more than happy to come to you to demonstrate a vehicle if you cannot get to us. Just call our Sales Team to arrange an appointment. If you want to book an MOT or service, or if you'd like some more information about the Renault or Dacia product range, Universal Garage (Whitby) Ltd are here to help. Our friendly sales team will share all their Renault/Dacia knowledge and our highly trained mechanics will keep your car running at its best. Address: Universal Garage (Whitby) Ltd, Unit 7B, Enterprise Way, Whitby, YO22 4NH.